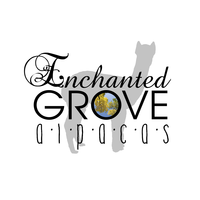 "Snowmass Conopa is named after Dr. Jane Wheeler and her husband Dr Raul Rosadio's non profit organization "CONOPA" which is dedicated to the conservation and protection of the wild vicuna and alpaca. He is a testament to the advanced possibilties inherent in Huacaya alpacas" quoted by Snowmass Alpacas. 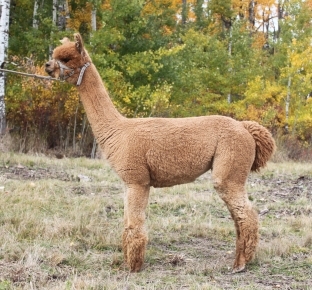 When we first put our hands on Conopa we could not believe his density, as we examined him closer we also found that he is fine and carries a consistent crimp style, he is simply the most stunning alpaca that we have ever seen. 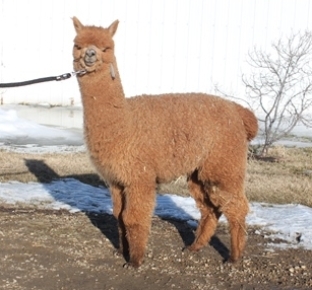 Conopa is probably the best purchase we ever made, he has added both quality and amazing personalities to our breeding program, we absolutely love this male. 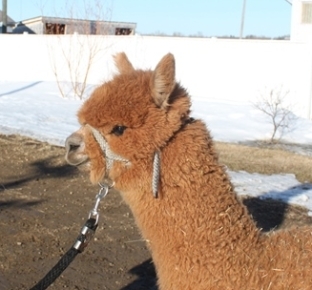 Bella is well balanced girl, and is holding her fiber qualities. She has gave us two beautiful female cria sired by Conopa, she is bred back to him due June 2016 She is an excellent dam she births easily and her babies grow quickly. Bella is a great opportunity to add a quality female to your herd.